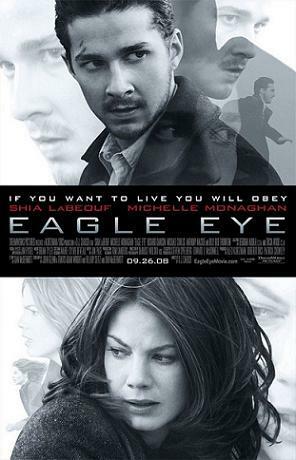 Eagle Eye is a 2008 action/thriller film directed by D. J. Caruso and starring Shia LaBeouf and Michelle Monaghan. The two portray a young man and a single mother who are brought together and coerced by an anonymous caller into carrying out a plan by a possible terrorist organization. The film has been released in regular 35mm theaters and IMAX theaters. Shia Saide LaBeouf (pronounced /ˈʃaɪə ləˈbʌf/ "SHY-uh luh-BUFF"; born June 11, 1986) is an American actor, voice actor, and comedian. LaBeouf began his comedy career when he was 10 years old, and then launched his acting career in 1998 at the age of 12. He became known among younger audiences for his part in the Disney Channel series Even Stevens, also appearing in three Disney TV movies. In 2003, LaBeouf made his film debut in Holes, also appearing in the lead role in The Battle of Shaker Heights the same year. In 2005, LaBeouf made his transition from teen roles in The Greatest Game Ever Played. In 2007, he starred as the leads in Disturbia and Transformers, and the following year he appeared in Indiana Jones and the Kingdom of the Crystal Skull as Indiana's son. LaBeouf reprised his role as Sam Witwicky in the Transformers sequel, Transformers: Revenge of the Fallen, and will also appear in New York, I Love You in 2009. LaBeouf's upcoming films include the lead roles in The Associate, and Wall Street 2. In May 2009, LaBeouf made his directorial debut by directing Cage's music video for the single "I Never Knew You".